Presenting the Gamma Ballhopper Family, with various designs/capacities to hold 50, 55, 75, 80, 90, 110, 140 balls! The ideal tennis court accessory for every professional tennis player, tennis instructor, school coach or even amateur tennis enthusiast! We pride ourselves in providing the best tennis court equipment for every need! These durable and lightweight tennis ball hoppers will make your life on the court easier and your training session 100% more efficient! Top Smashing Reasons to Choose Our Unique Tennis Ball Pickup! Its unique floating wire design makes tennis ball pickup extremely easy! A heavy duty gauged steel frame with a reinforced welded construction will guarantee maximum durability! The diamond clad weather-resistant gold powder coating is going to protect your tennis accessory from any weather conditions! Due to its handy hinged lid, you can avoid accidental tennis ball spilling! The unique protective wear feet make this tennis court pickup unbelievably durable! 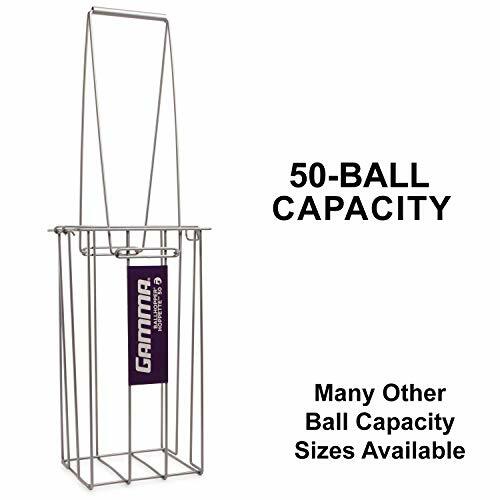 Capacities range from 50 to 140 balls perfect for your needs! This premium Gamma Ballhopper HiRise tennis ball pickup features convenient handles for easy ball pickup and seamless ball feeding! Finally, you can own a tennis court accessory you can rely on! We, at Gamma sports, aim at designing and producing the best tennis court equipment available! That's why we are 100% confident that our premium HiRise Gold 75 tennis ball pickup will get the job done! Why Miss Out on This Risk-Free Opportunity? These amazing Gamma Ballhoppers are backed by a no-hassle money back guarantee, so that your investment is 100% risk-free! 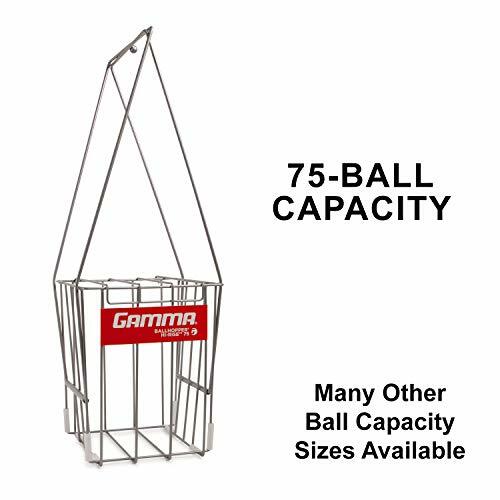 UP TO 75 TENNIS BALLS CAPACITY: Our premium tennis Ball Hopper Hi-Rise sports a 75 tennis ball holding capacity, making it ideal for keeping your tennis balls in one place, neat & organized. This tennis court accessory is a perfect tool for professional teachers at camps, clinics or private lessons as well as a must have for parents and tennis players. PREMIUM QUALITY MATERIALS: Being in the tennis equipment business for over 30 years we know how to deliver a product with the perfect combination of high quality and value-for-money. The Ball Hopper Hi-Rise is made of carbon steel wire with GAMMA's premium Diamond Clad weather resistant coating to stay like new for years on end. SMART DESIGN-MAXIMUM PRACTICALITY: GAMMA's Ball Hopper Hi-Rise tennis ball pick-up sports a smart design with handles that make it super easy to carry around and place wherever you want with ease. Plus, the handles can be flipped over to allow the basket to stand at fingertip height, for maximum convenience. SMART LID-NO CHASING AFTER TENNIS BALLS: Another great feature of our high quality tennis ball pick-up is that it comes equipped with an attached lid that will prevent spillage and will keep the balls inside the basket. No more chasing after tennis balls and no more hassle! EASY TO SET UP: Our tennis ball pick-up can be set up intuitively in a matter of minutes and in no time you can start enjoying practice and spend less time gathering up balls! The Ballhopper BallTube 18 from Gamma lets you quickly and easily pick up tennis balls with the use of special end caps. 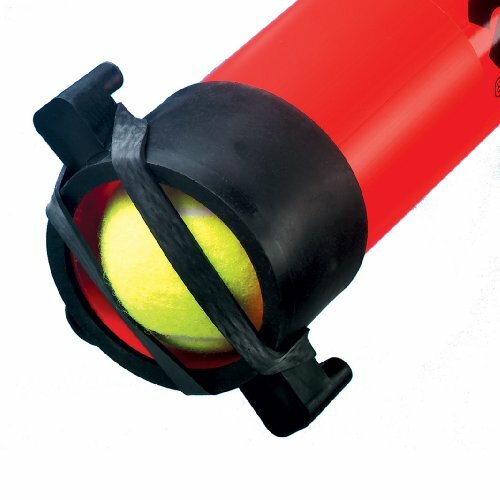 The BallTube can hold up to 18 tennis balls and comes with an integrated fence clip for hanging and easy ball dispensing. The adjustable shoulder strap allows for convenient portability. Balloon port 80 deluxe holds 80 balls and comes with wheels for easy Maneuverability. The handles are an extra long 33 inch for more convenient feed and pickup. Very lightweight yet durable makes this one of the most premium hoppers on the market. Loaded with patented features: legs lock in up and down position. Bars at the top slide closed so your the balls don't fall out during transport. Bars roll at the bottom so the ball slips in the hopper easily. 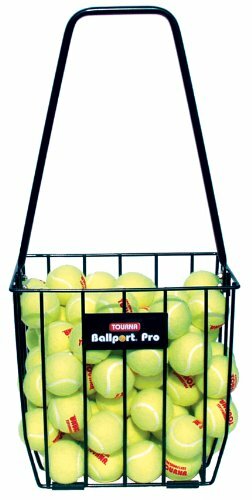 Tourna Ballport Pro holds 85 balls. Heavy duty construction for durability. Portable and easy to pick up and hold tennis balls. 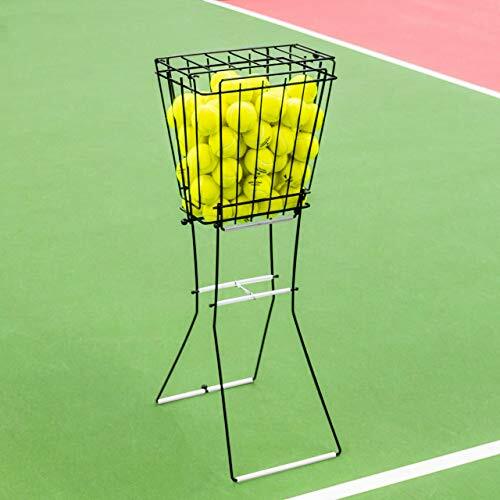 EXCELLENT BALL CAPACITY - This tennis ball basket hopper is the ultimate court companion for tennis coaches. The high-quality basket will hold up to 72 regular sized tennis balls. QUALITY CONSTRUCTION - This tennis ball hopper has been built to last. The frame is made using heavy-duty steel which is powder coated to give it excellent weatherproof & rust-resistant abilities. EASY BALL PICK-UP - This basket easily converts into a sitting basket by simply folding the legs in on themselves. This allows you to easily collect all your tennis balls without bending down. LOCKABLE LID - When you're not out on court, this basket will keep your tennis balls extra secure thanks to its lid. The design also allows you to add a padlock to it if necessary (not included). PREMIUM DELIVERY SERVICE - You'll struggle to find a better-quality ball hopper at a better price than ours. Order today and we'll guarantee your basket is dispatched within the next 24 hours! ENHANCED TRAINING SESSIONS! 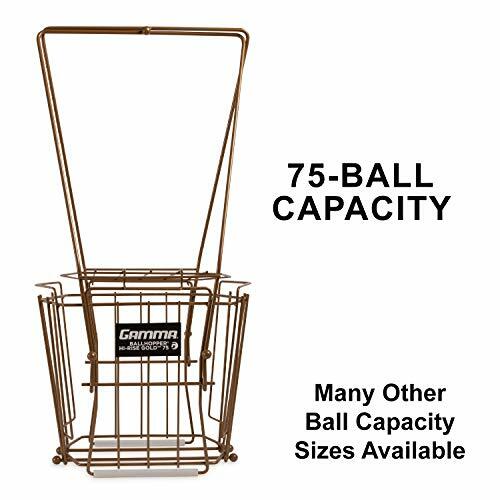 - Make sure that your tennis training session is 100% efficient by choosing the Gamma Ballhopper premium HiRise Gold 75 tennis court ball pickup caddy! HEAVY DUTY CONSTRUCTION! - Our amazing tennis ball pickup features a unique heavy duty gauged steel frame with a reinforced welded construction that maximizes its durability and efficiency! DIAMOND-LIKE DURABILITY! - Due to its diamond clad weather resistant gold powder coating and the protective wear feet, you can rest assured that your premium tennis court accessory is going to get the job done!! EXTRA-SAFE AND CONVENIENT! 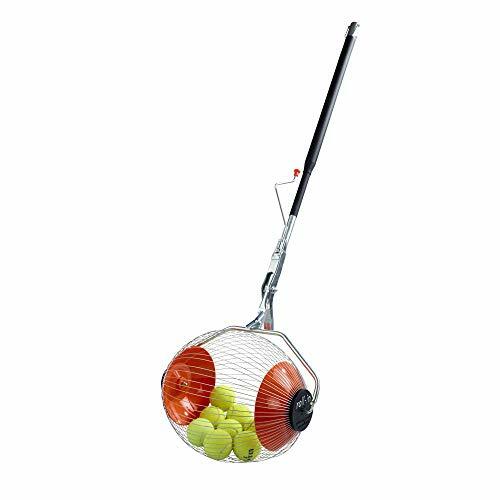 - Its safe and secure hinged lid prevents ball spilling and its convenient handles and floating wire design, make it extremely easy to pick up and flip for seamless tennis ball feeding! SERVING FOR SUCCESS! - We, at Gamma, are the undisputed leaders when it comes to durable and handy tennis court equipment! One of the reasons is that we confidently back our tennis products with a full money back guarantee! The Kollectaball Max is the fastest method of collecting tennis balls. Simply use the tennis ball collector to roll over the balls to collect 60 tennis balls in a matter of seconds. We're delighted to say that Kollectaball not only makes picking up tennis balls, fast and easy but it also makes picking up the balls fun! And, at the end of the day, that's exactly what we all play tennis for! If you can add additional enjoyment for kids in your lessons, whilst simultaneously making your life easier and saving your back from hardship, we think that's worth investing in. FUN - Our tennis accessories make the most boring part about tennis, picking up tennis balls, fun! Make every aspect of your tennis coaching fun for kids. FOR EVERYONE - The Kollectaball K-MAX ball basket and collector tube works brilliantly for tennis coaches but also for parents teaching their kids tennis or anyone who uses a tennis ball machine, tennis ball launcher or tennis ball trainer. Ball can be emptied from the basket back into a container in seconds using the patented wire opener system. PICK UP ANY TYPE OF TENNIS BALL - Pick up tennis balls of any kind, mini green, mini red, mini orange, pick up soft balls and full court balls as well! DURABILITY - Extremely durable wires tested at over 10,000 hours of continuous collecting without breakage. Works great on hard courts, clay courts or even grass courts! Any damaged wires can be individually replaced. ASSEMBLY REQUIRED - Item is packed in a flat cardboard box for easy shipping. Product requires a 20 to 30-minute assembly. Assembly instructions inside the box and videos available online. All tools included. Tenn Tube is the original patented ball pick up tube. A great fun way to pick up balls. Kids, parents, and teaching pro's love them. Our MultiMower is the best-value ball mower in the industry! It doubles as a teaching cart, stretching your budget like never before! It is easy to transport and is equipped with a unique "ridged" roller for a smooth and effortless ball pick-up. Plus, 2 extra back wheels make it easy to tilt and roll over small bumps on walkways. Ground level pick-up arms close for feeding or wheeling through gates. SIMPLE, EASY, EFFICIENT: Easy to transport and equipped with a unique "ridged" roller for a smooth and effortless ball pick-up. 2 extra back wheels make it easy to tilt and roll over small bumps on walkways. TEACHING CART: The basket on top of the cart allows you to easily feed balls to players without stretching down to grab them. COLLECTS ALL BALLS: Another great feature is that the unit picks up regular tennis balls, plus red, orange, and green transition balls. EASY TO TRANSPORT: Remarkably smooth, the MultiMower easily moves around any court surface, and can be used indoors and outdoors. The ground level pick-up arms close for feeding or wheeling through gates. DIMENSIONS: Top basket dimensions: 19 front to back, 22.5 wide, and 6.5 deep. Ball capacity is 300 balls. 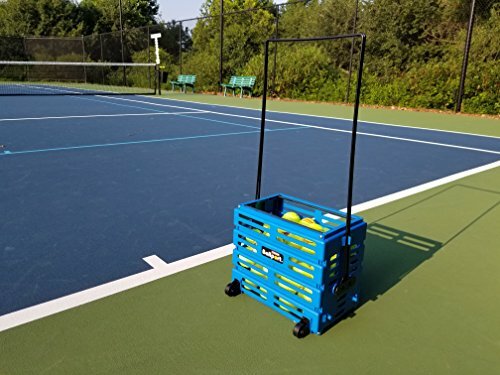 Give yourself the gift of convenience and take your game to the next level with Morvat's Tennis Ball Hopper Basket Cart. The cart allows you to take up to 150 balls with you and easily transport them from your home to the tennis court, and from court to court. 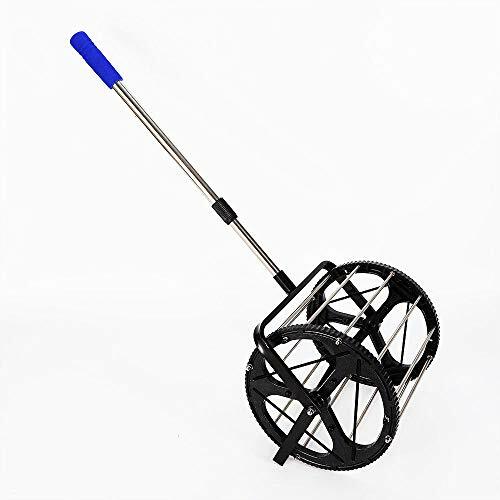 The cart is constructed to be sturdy and strong and the thick, durable basket can easily support the weight of 150 balls, even as it is rolling. 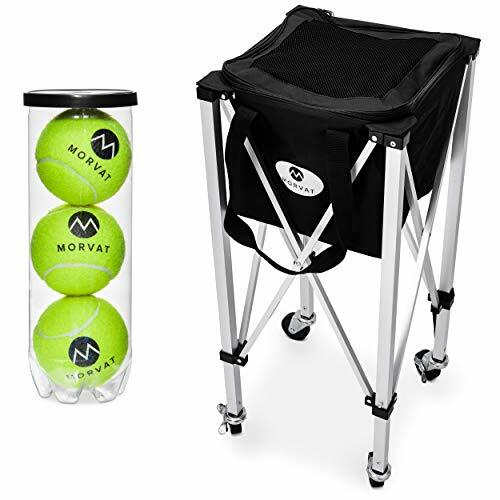 The Morvat tennis ball basket is more than just durable- it's dependable. The ball hopper is super easy to set up and take down and opens and folds in seconds. It also comes with a convenient carry bag so you can easily take it with you and have it in one compact space, plus the folded down cart fits easily into the trunk of a car! At Morvat, we are dedicated to our customers. We want every customer to have a great experience and be totally satisfied with their purchase. That is why we offer a one year warranty on our products and offer a replacement or refund if you are not happy with your purchase. So you can Add To Cart worry free! GET MORE FROM YOUR TRAINING SESSIONS- Spend more time playing and get the most out of your training and practice sessions with the Morvat ball hopper basket cart. Guaranteed to improve efficiency and save you time and energy! 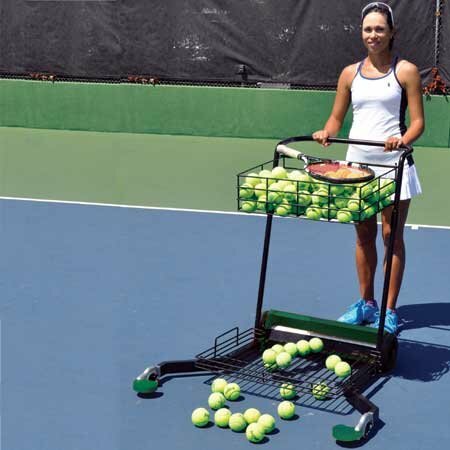 HEAVY DUTY- The tennis ball cart is designed to be strong and durable, and can hold up to 150 balls! 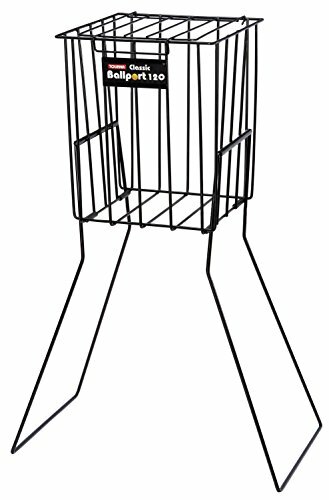 The lightweight aluminum alloy frame supports the basket and can easily be rolled between locations. EASY PORTABILITY- The ball cart was designed with portability in mind and you can take it with you wherever you like! The frame of the ball hopper basket folds up quickly and easily and can fit effortlessly into the trunk of a car and the insert can be removed and used as a bag by itself if you want something even more lightweight! 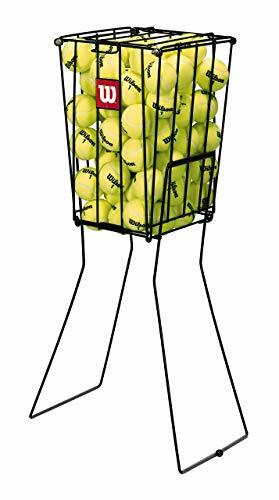 GREAT GIFT IDEA- The tennis ball hopper cart makes the perfect gift for the tennis lover in your life! Give them the gift of convenience and ease for their tennis session- they are sure to love it! SATISFACTION GUARANTEED- At Morvat, we are dedicated to our customers. We want every single customer to have a great experience and be completely satisfied. If you are not completely satisfied, we will give you a replacement or a refund. So Add to Cart now- risk free! 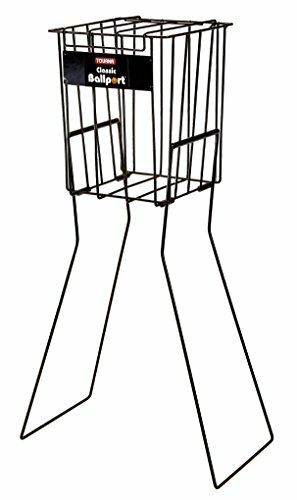 Classic wire design that picks up and dispenses up to 70 balls. Handles lock in the down position for added stability. Attached lid secures ball during transport. A classic way to pick up tennis balls. Suitable for all ages, and all types of balls. Need a lot of balls to practice with? 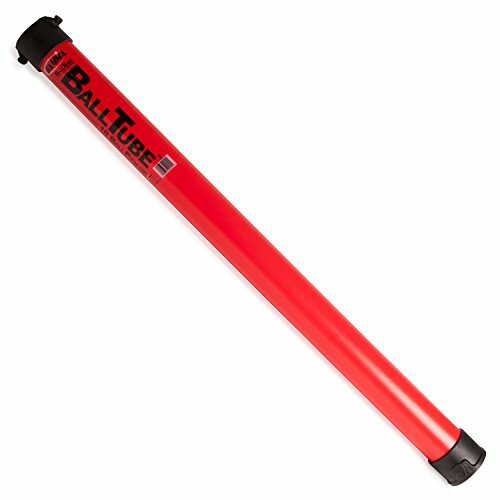 The Ballport 120 is a real whopper that can hold enough tennis balls for a long practice and still fit in the trunk of your car. Operates just like a smaller traditional wire tennis hopper, but with a larger capacity. Legs fold down so you can practice your serve, and legs fold up to carry and pick up balls. Lids closes shut for a more secure transport. 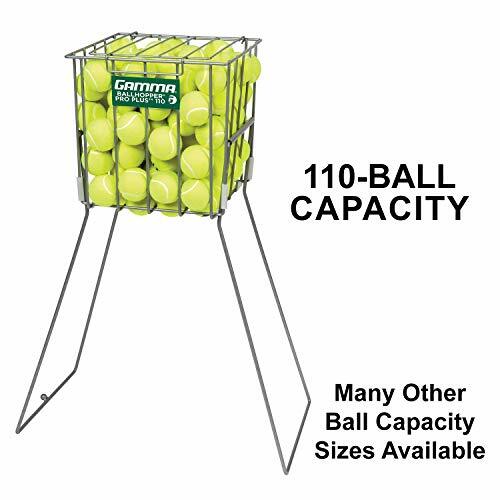 110 TENNIS BALLS CAPACITY: Our premium tennis Ball Hopper Pro Plus sports a 110 tennis ball capacity, making it ideal for keeping your tennis balls organized in one place. This tennis court accessory is a perfect tool for teachers, parents, and players. PREMIUM QUALITY MATERIALS: We deliver a product with the perfect combination of high quality and value-for-money. This Ball Hopper is made of carbon steel wire with GAMMA's premium Diamond Clad weather resistant coating to stay like new for years. SMART DESIGN-MAXIMUM PRACTICALITY: GAMMA's Ball Hopper sports a smart design with handles that make it super easy to carry around and place wherever you want with ease. The handles can also be flipped over to allow the basket to stand at fingertip height. SMART LID - NO CHASING AFTER TENNIS BALLS: Our high quality tennis ball pick-up comes equipped with an attached lid that will prevent spillage and will keep the balls inside the basket. No more chasing after tennis balls and no more hassle! 1. Spring ball position, you can adjust the height. 2. Stainless steel handle, durable. 3. The drum wall is thickened. 4. The support on the drum can make the ball thrower not stand. 5. Hook the elastic rope on the drum and the ball can be poured out. Save Time: Spend less time chasing balls and more time on your serve! Both an efficient rolling tennis ball collector and self-standing ball hopper, the Roller is the indispensible new tennis tool. Smooth Rolling: Operate the Ball Hopper just one hand on all surfaces: clay, hard, grass, and carpet. Pick up several balls at a time, and store over 50 balls in the rolling drum. Spring ball position, you can adjust the height. With no stress on your arms or back, simply roll the it over the tennis balls and they easily enter the wire cage. Hook the elastic rope on the drum and the ball can be poured out. Stainless steel handle, durable. Works with regular tennis balls as well as junior/progressive tennis balls. The drum wall is thickened. Suitable for hard courts, clay courts or grass courts. 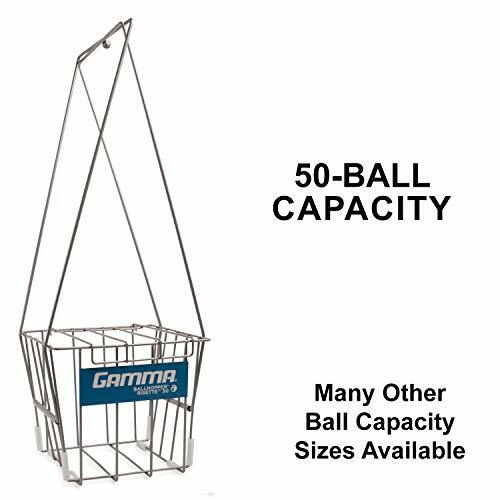 50 TENNIS BALLS CAPACITY: Our premium tennis Ball Hopper Risette sports a 50 tennis ball capacity, making it ideal for keeping your tennis balls organized in one place. This tennis court accessory is a perfect tool for teachers, parents, and players. Presenting the Gamma Hoppette - Holds 50 Balls! 50 TENNIS BALLS CAPACITY: Our premium tennis Ball Hopper Hoppette sports a 50 tennis ball capacity, making it ideal for keeping your tennis balls organized in one place. This tennis court accessory is a perfect tool for teachers, parents, and players. SMART DESIGN-MAXIMUM PRACTICALITY: GAMMA's Ball Hopper sports a smart design with handles that make it super easy to carry around and place wherever you want with ease. Plus, the handles can be removed to allow for maximum storage convenience. 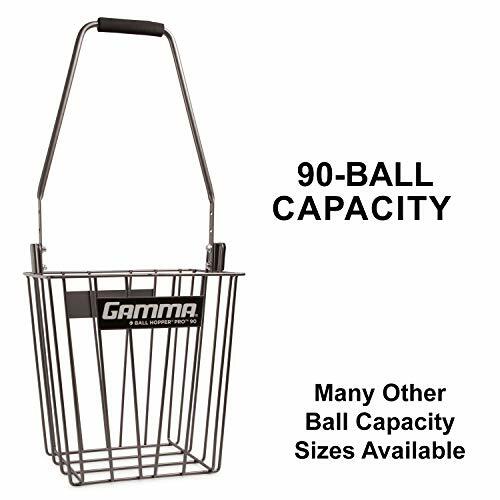 90 TENNIS BALLS CAPACITY: Our premium tennis Ball Hopper Pro 90 sports a 90 tennis ball capacity, making it ideal for keeping your tennis balls organized in one place. This tennis court accessory is a perfect tool for teachers, parents, and players. SMART DESIGN-MAXIMUM PRACTICALITY: GAMMA's Ball Hopper sports a smart design with handles that make it super easy to carry around and place wherever you want with ease. The handles can be adjusted for added convenience.